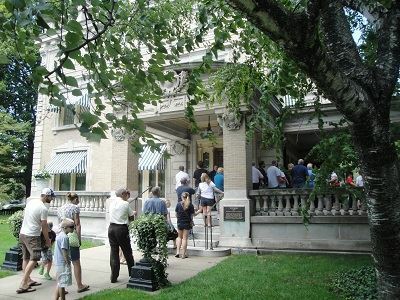 GROUP TOURS of ten people or more at Ruthmere and the Havilah Beardsley House are available by reservation only Tuesday-Friday. SPECIALTY TOURS are offered for groups (15 people or more) who want a once-in-a-lifetime experience. Tea & Crumpets – Enjoy Ruthmere’s grand tour and finish up with tea and sweets in the Game Room, or if weather permits, outdoors under the covered Piazza. Hot tea, mini scones, tea cookies, macaroons and mini muffins will be served. Tour start times for Tour &Tea at 10am, 11am, 12pm, 1pm, 2pm or 3pm Tuesday-Friday. $20 per person, maximum of 45 people. Afternoon Tour & Tea – Enjoy Ruthmere’s grand tour and finish up with a period tea in the Game Room, or if weather permits, outdoors under the covered Piazza. Service of hot tea, tea sandwiches, mini scones, macaroons and mini tarts. Tour start times for Tour & Tea at 10am, 11am, 12pm, 1pm, 2pm or 3pm Tuesday-Friday. $25 per person, maximum of 40 people. High Tea/Downton Abbey – Enjoy Ruthmere’s grand tour and finish up with a period tea in the Game Room, or if weather permits, outdoors under the covered Piazza. Service of hot tea, cold lemonade, 3 types of tea sandwiches, mini scones, tea cookies, mini tarts and macaroons. Tour start times for Tour & Tea at 10am, 11am, 12pm, 1pm, 2pm or 3pm Tuesday-Friday. $30 per person, maximum of 35 people. Private Parties - Private parties can be arranged for a tour bus group on a customized basis. Call for a quotation. *ALL GROUP TOURS MUST BE BOOKED AT LEAST 20 DAYS IN ADVANCE, OR 60 DAYS IN ADVANCE IF THE BOOKING REQUIRES FOOD OR CUSTOMIZED MUSIC BOOKING.